As usual, apologies for the crappy photo. 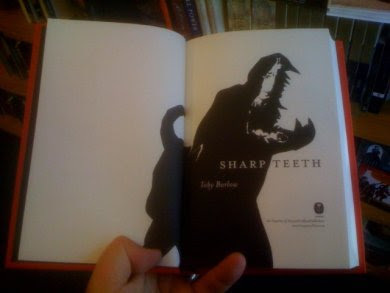 But this is pretty cool: the cover of Sharp Teeth is great (and as a reader points out, there are foil teeth! ), but I think I like the title page even better. There are wonderful illustrations throughout by Natasha Michaels as well. The production on this is fantastic too. I believe it has a metallic for the white on the front. Looks great, I love that it's on cloth! I want to sink my teeth into it. Plus? It's an epic poem. About werewolves. 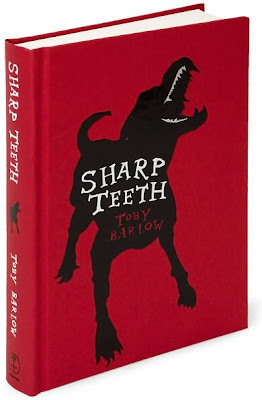 When I saw this book, it reminded me of "The Curious Incident of the Dog in the Night-Time" by Mark Haddon. Red/black/white, and a dog in silhouette. Different effect, but I thought Haddon had a new book out! Same here re: Haddon -- I still think the design rocks.